This is a work-around required for Windows Vista and more recent Windows versions. It is needed when you want to use a sound device other than your default sound device. For example, this is a common issue for SignaLink USB interface users. The Problem: In Windows XP and earlier versions of Windows, the recording and playback functions of a sound device were coupled. If you selected a specific sound device for a function, BOTH the recording and playback function of that device were used. You couldn't disassociate them. So when AGWPE was written, only one field was required to specify the sound card you wanted to use. But in more recent versions of Windows, you must separately choose one device for recording and one for playback. Unfortunately, as of version 2013.415 AGWPE, has not been changed to reflect this requirement. 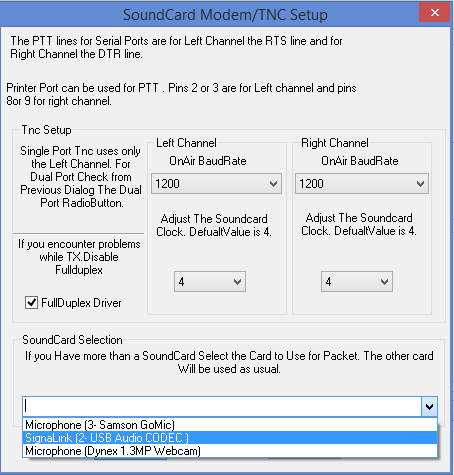 The sound card device you choose in AGWPE will select Recording (Rx ) device, but Windows will use the default sound device (usually your speakers) for playback (Tx). There is no way in AGWPE to specify the correct device for playback (Tx). The Solution: Rename the desired playback and recording devices in Windows so that they have the same name. Remember this workaround is for Vista and more recent versions of Windows only. The screen shots below are for Windows 8.1. 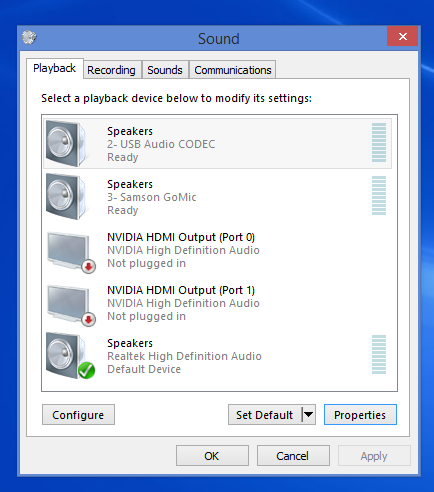 In this sample computer, Windows has identified 5 different Playback devices. The device the user wants to use for AGWPE is the one labeled "Speakers: 2- USB Audio CODEC". This is a USB SignaLink. The SignaLink identifies itself to Windows as "USB Audio CODEC". Then he clicks Apply and OK to save the properties changes. This returns him to the Sound window where he now clicks on the Recording tab. The renaming process is repeated here: he selects the "MIcrophone: 2- USB Audio CODEC" device i.e. the SignaLink, and then the Properties button. On the resulting Microphones Properties window, he changes the name to "SignaLink", being careful to spell it exactly as he spelled it for the Speaker properties. Again he clicks Apply and OK.
Then save all your choices and restart AGWPE. Now both TX and RX should now be handled correctly by AGWPE and Windows. 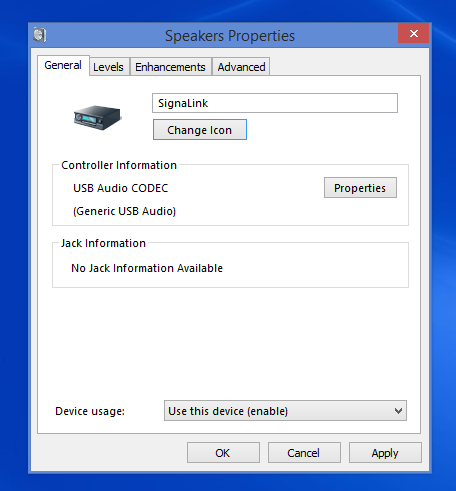 Warning: It is possible that Windows may forget the renamed sound device, especially if the external device is not plugged in when you first boot the computer. If this happens, you may need to repeat the renaming the process in Windows.